At just under 7cm and weighing in at just 52g long, the mini DAB promises to pack in as much technology as those twice its size, "providing crystal clear listening for a huge range of FM and digital radio stations." 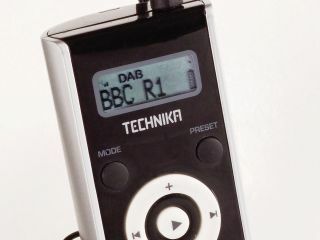 As with any decent DAB, the Technika DAB-108P scans automatically for all radio stations in your area, allowing you to save your favourite stations, edit display options and change the sound settings to suit the music genre of your choice. Sarah Butcher, Audio Buyer at Tesco, says of the super cheap portable digital radio that it is, "the latest in a long line of cutting-edge technology products from the Tesco Technika range, which we have been able to offer our customers at market-leading prices. "As many Brits may be feeling the pinch at the moment, we're delighted to be stocking such a pocket-friendly, quality radio at such a pocket-friendly price."